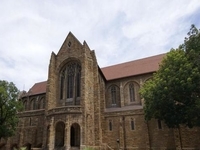 Travelers are voting Johannesburg South Africa Temple, St Boniface Church and St Cyprian's Cathedral as the best of 5 churches in South Africa. Also popular are St. George's Cathedral in Cape Town and Hatfield Christian Church in Pretoria. Want more? Check out our map of churches in South Africa or this 1 churches in Cape Town. The Johannesburg South Africa Temple is the 36th operating temple of The Church of Jesus Christ of Latter-day Saints.